Remember all those Transformers toy commercials from the '80s that showed kids battling each other with the latest Autobots and Decepticons? 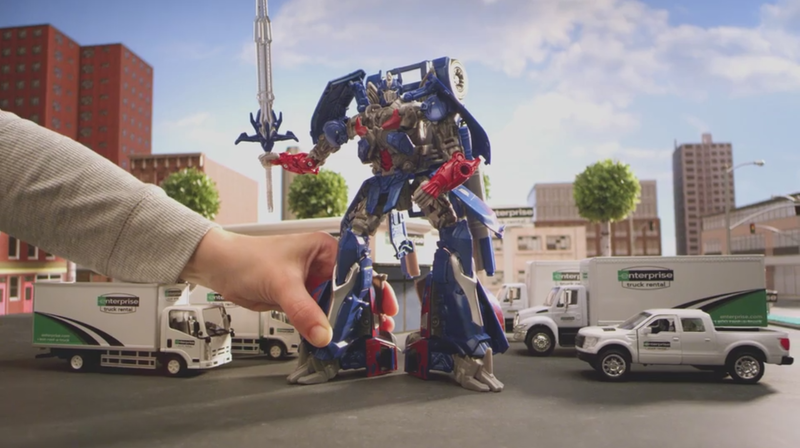 To coincide with their partnership and release of Transformers: The Last Knight, Enterprise Rent-A-Car has produced a new TV commercial that will make you want to get your toys out of storage. ST. LOUIS June 1, 2017 – Get ready to roll out: The Autobots and the “auto rental bots” are joining forces to move us all forward! Enterprise Rent-A-Car today announced a partnership with Paramount Pictures on the highly anticipated release of the new movie, “Transformers: The Last Knight,” directed by Michael Bay, in theaters June 21. Through the partnership, Enterprise is producing custom movie-themed digital content and promotion in branches throughout the country. In addition to the video, Enterprise customers will also notice movie-themed signage inside Enterprise branches through June. For more information and to view Enterprise’s Transformers-related video, visit www.enterprise.com/transformers.